Whether your fiscal year starts now or is only part of the way through, January is a good time to evaluate your fundraising progress. To help you're planning, here's an email I sent our Fundraising Kick subscribers yesterday. Listening to a conversation between Stephen R. Covey and his son Stephen M.R. Covey last week reminded me of the work you do with major donors. one in the physical world. To drive this point home, they went to a huge hole in the ground and got an architect to tell them what was being built. What in the physical was a hole was going to become a large shopping mall. The blueprints had all the plans for the details of the shopping mall infrastructure, down to even which stores were leasing which space. Every thing had been imagined before it was built. Like that old adage: measure twice, cut once. Habit 2 is the missing link in major gift programs. Usually, we get a goal. “We need to raise $X more than last year.” So we lean on major gifts to do that. We do some planning: numbers of gifts, people to ask, activity goals for fundraising staff and leadership. But we don’t go far enough. To truly be successful in major gift fundraising, we need to create in our mind the types of relationships we hope to create for the nonprofit. January is a great month for that. List your major gift assignments on a spreadsheet and start planning what you want to communicate with each person each month. I find it easiest to figure out how much I want to ask for and when I want to make the ask. Then I fill in the months with relationship building activities that honor the donor. You’re creating a blueprint for the relational infrastructure of your fundraising program. Take time this week to build out your blueprints. Don’t worry that they’ll change. Most plans do. But take time this week to craft the first draft of plans for the people who could move your fundraising forward. And be sure to look at last year’s giving to see if there are new people who might need to be added to your blueprints. This isn't just the case in major gifts. We can get so focused on doing - sending letters, throwing fundraising events, posting to social media - that we never figure out if we're doing the right activities in the right way. When talking about peoples careers, Stephen Covey (the father) observed that some people are so busy climbing the career ladder, they never check to see if it's on the right wall. 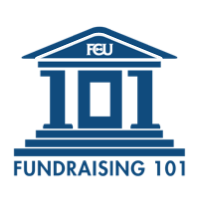 Don't go to the wrong place with your fundraising. If you're not getting the results you want, stop. Take some time this month to find out why. Are you so focused on grant funding that you don't realize a fundraising basic that grants only account for 15% of the charitable money given each year? Are you so focused on sending letters that you don't realize you're not sending the right fundraising letters? Are you so focused on "finding new donors" that you don't realize you're losing 60% of those new donors each year because you're not thanking them correctly? Or do you need to take time to thoughtfully plan out the relationship touches you want for the donors assigned to you? Whatever it is, take the time to do both creations. Don't skip one. Your fundraising will be much better for it. And you might just find yourself liking fundraising more. Fundraising Kick emails are weekly coaching emails written to help nonprofit executive directors get out from behind their desk and ask 5-10 major gift prospects for money. To buy a subscription, go to: http://FundraisingKick.com/. I am so lucky that i came on your blog while scribbling the web. Great piece of advice by Marc. You said it right, we need to focus on the core values as well while not only thinking about fundraising. Especially i loved the second point, "Begin with the End in Mind". I have already downloaded Marc's book..Looking forward to learn more from it.